T his isn’t as much of an “advice” post about conventions. It’s more me looking back at all the ones I’ve attended and considering what they’ve cost me on multiple levels. Cons are expensive. If you’ve ever been to one, either as a vendor, a panelist, or attendee, you know this. It starts with the badge, which can be anywhere from $40-100+ depending on how many days you’re going and the size of the con. Then there are the logistics. Unless it’s a convention occurring in your home town or an easy drive from your home, the travel costs can ramp up quick. Airplane tickets are a beast these days, especially with so many airlines nickel-and-diming for everything. I’m pretty sure they’ll start charging for the luxury of breathing during a flight, or for seats that aren’t in the cargo hold. If you’re driving, gas adds up, not to mention the wear-and-tear on your car. Once you’re there, unless you plan to sleep on the streets, you’ve got to factor in lodging. If I’m at a show on my own, I often go to AirBnB for my stay, while hotels near the convention center can run upward of $200 a night. There’s a reason why you’ll sometimes find 10 people packed into a two-bed room, taking sleeping shifts in order to be able to afford the stay. Of course, we can’t forget about con food. 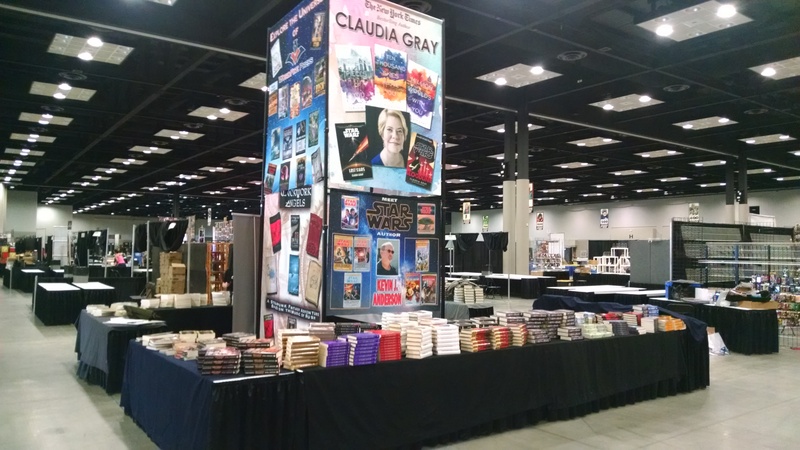 Many conventions are held…where else? Convention centers! These places often have contracts with certain food and beverage vendors who have the opportunity to hike their prices however much they want, often for edibles that aren’t all that healthy. But for those who aren’t willing to wander far afield from the con and who didn’t prepare snacks ahead of time, these become the only option to avoid starvation. 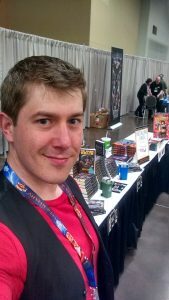 Beyond the essentials, some cons charge more for special events, such as celebrity signings or access to certain shows. Plus, you factor in all the goodies you end up buying, no matter how hard you try to stick to a budget, and it’s not surprising to come home to a few extra charges on the credit card than you were expecting. 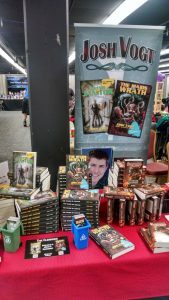 Oh, and if you’re there as a vendor–as I usually am, trying to sell my books–then there’s the cost of the booth or table you registered for (which you usually do at least 6 months in advance). So you spend much of the con trying to see if you’ll at least break even on everything it cost you just to be there among the crowds. Beyond all that, though, the thing that sticks out for me…the biggest cost in the end…is my time. 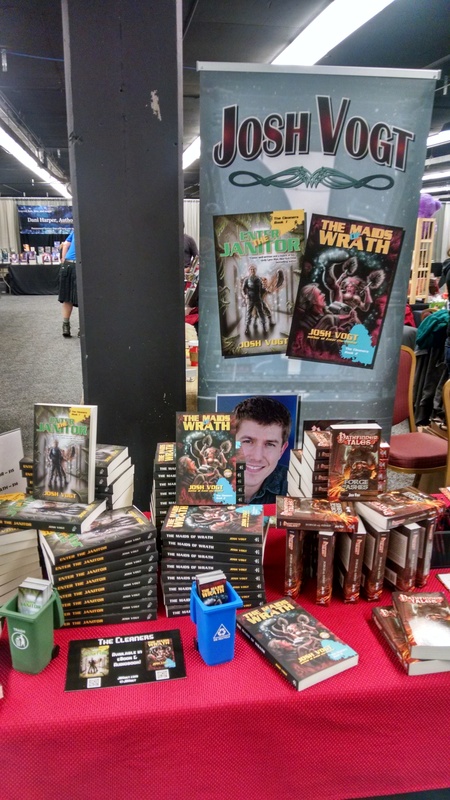 When I’m at a con, I’m not writing nearly as much. Since I make my living off my writing, that could pose a problem if it went on for too long. I’m also outside of my normal, productive routine, away from my work space and gym and familiar surroundings that let me focus on getting projects checked off. And there are also many, many people at these cons that I want to see, some of whom I may not otherwise get to talk to face-to-face for the entire year except for this event. Yeah. Cons can cost a lot. However, when I’m at a con, I meet amazing people. I hear amazing stories. I see amazing things. I often come away with amazing ideas. Excited. Eager to get back to work. A bit more driven and determined than I was going in. Cons are an invaluable investment for me, practically every single time. So, you know what? Looking back, there’s one thing I can say for sure. I’d pay that price every single chance I got.